Well, Sunday June 21st was the BIG day: my first triathlon. I was at an advantage over some of the competitors in that my years of club cycling have given me good cycling fitness and so I didn't have to do too much extra cycling training. 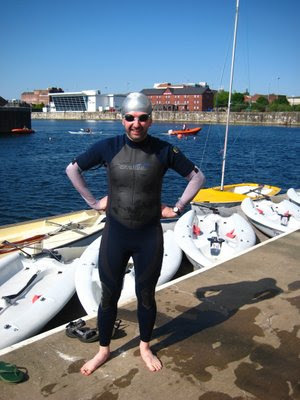 I put most of my time and effort into getting my swimming back up to scratch, joining the Liverpool Masters training group at the Wavertree Aquatic Centre. This is made up mainly of people between 25 and 70 who used to do some competition in their younger years and would now maybe like to do some Masters (Veterans) swimming galas or the triathlon. I myself experienced a taste of competition (+ the intensive training that goes with it) as a young boy, competing at breaststroke in a few galas for the City of Southampton club. I am just sitting working on a computer and decided to view this DVD again and it struck me that I would like to update you on the past year. I asked for a copy of this at a time when I was asking serious questions of myself. There was a stirring inside me, and after much searching it became apparent that God was calling me. I went along to Trent Vineyard Church in Nottingham as its outward looking approach appealed to me. On the 18th of May last year in church, hands were laid on me and prayer offerred after I had let it be known that I had just decided that I believed in Jesus as God and wished to trust and follow him. During that prayer I had the humbling experience of feeling the Holy Spirit touch me. 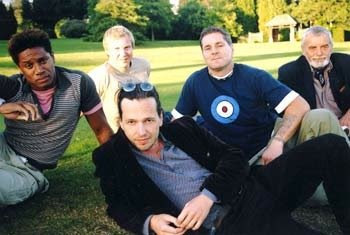 In 2005 the 3-part BBC 2 tv documentary series"The Monastery" followed 5 contemporary men who volunteered to live 40 days at the Benedictine monastery of Worth Abbey. A friend of mine managed to do a decent transfer from vhs to dvd for me. After getting permission from the Abbott of Worth Abbey, Abbott Christopher Jamison, I made it known to friends that I could give them copies. I also advertised the fact on this very blog. It turned out that the BBC weren't interested in releasing it commercially. The only payment that I have ever asked for from those requesting copies is prayers for my family. As I said in my previous post, I went over to Ireland to see my parents last weekend. 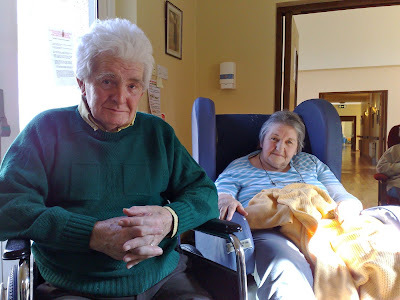 Both are in their 80s and are now together in the same nursing home: Mum = bed/chair bound, Dad = wheelchair bound. Neither can walk but both remain pretty alert mentally, though Dad's Parkinson's is gradually taking its toll. What is lovely is that after having been through much trauma and suffering throughout their life together, they have each attained a level of inner peace which I think shines out from their faces. A God-given grace for which I am immensely grateful. The photo was taken just after the Saturday evening Mass of Pentecost. Our Gemma (my cuz) has a new video to go with the lead single off her E.P. "Oliver". Simple vid to go with a beautiful song. This is after having just finished a tour with Liam Clancy (last surviving member of the world-famous Clancy Brothers - Irish traditional heavyweights) and other guests.